We seem to be on a bit of a mini-theme this week with our on-going Fairy Tale unit and our newly started Growing Things Science unit on plants. Our timing couldn’t have been more perfect. 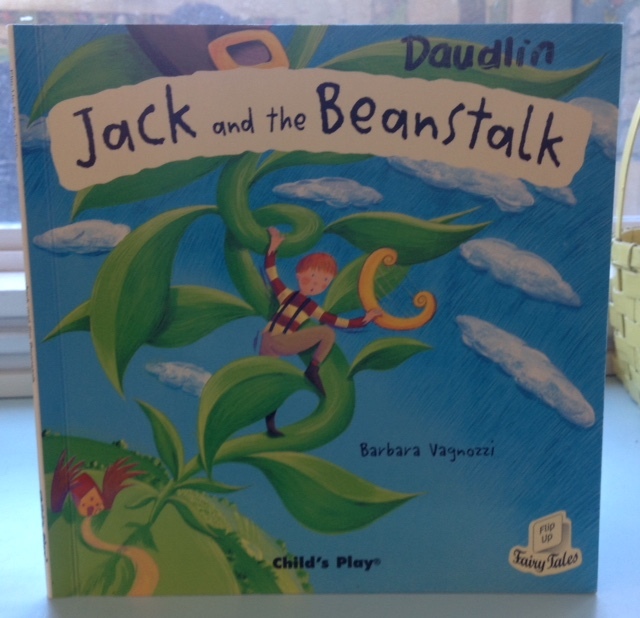 Since wrapping up “The 3 Little Pigs,” we started our next Fairy Tale, “Jack and the Beanstalk.” We read a delightful, lift-the-flap version, where the children’s sharp eyes ensured we didn’t miss a single flap! 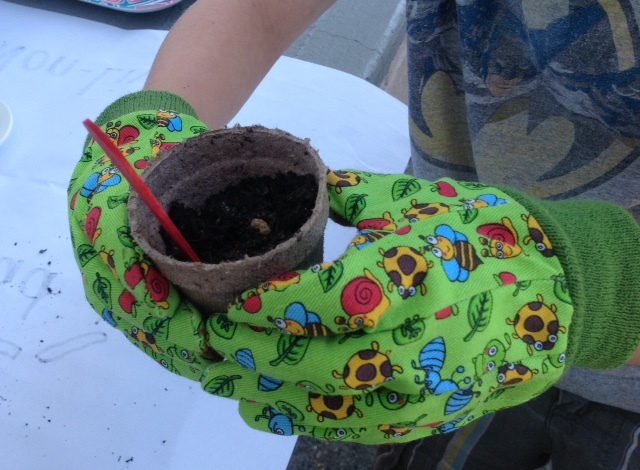 Instead of a craft, we decided it was time to plant some beans to try and grow a beanstalk of our own. So in small groups we planted beans, while the rest of our class designed their plant markers. We’ve been talking a lot about the needs of a plant, so we asked the children to draw all the things a plant needs to grow in a healthy way: soil, water, sunshine and love. 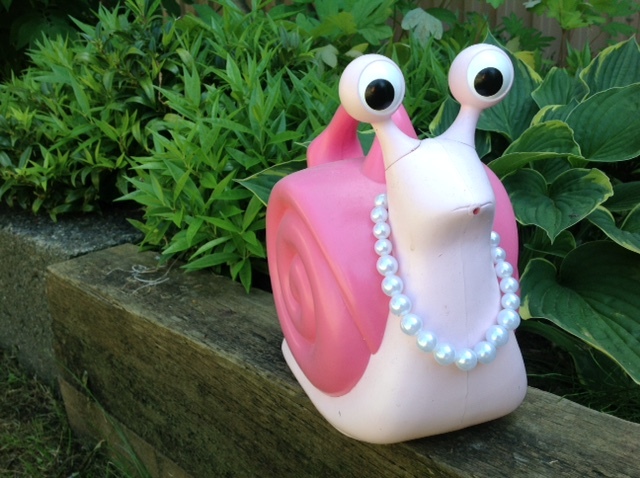 To add to the festivities, Miss Pink made her annual visit to help water our newly planted seeds. We launched our Growing Things unit last week by going for a walk around the school to look for examples of living and non-living things. We defined “living” as things that grow, and “non-living” as things that do not grow. We saw some wonderful roses and trees growing on our school grounds, a butterfly and a huge bee in a California lilac shrub. We saw many non-living things: soccer nets, doors, cars and rocks. The children understood that when a branch is attached to a live tree, it is living until it gets broken off. In the same way, when they saw a dead worm on a school path, the children knew in their own small world that life is fragile and can quickly change from living, to not. We finished up our week with another lesson on seeds. We read The Surprise Garden by Zoe Hall. It’s a fun story where a mom gives her children a variety of seeds to sort and then plant. The children grow a variety of plants and vegetables to eventually make a lunch of salad, sunflower seeds and watermelon. 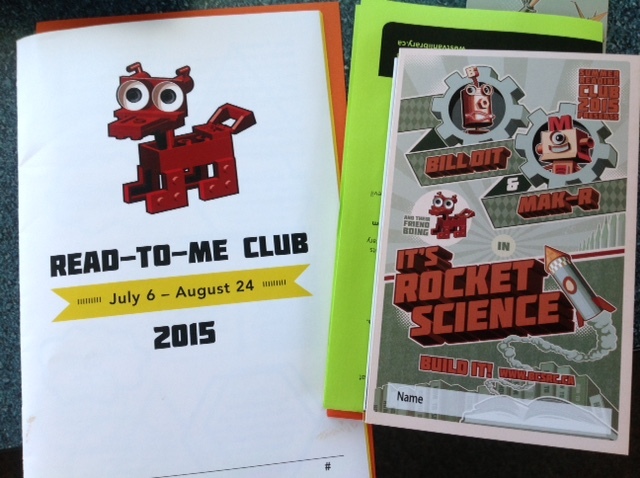 The West Vancouver Memorial Library gave a presentation on their Summer Reading Clubs for 2015. This year theme is called “Build It.” We encourage all Kindergarten families to register at the Library and participate in this great annual summer tradition. While older children and independent readers can read their own books, younger children can participate in the “Read-to-Me” Club and be read to by a parent or sibling. The most important idea is that the children read, or be read to, every day for 15 minutes, for 50 days. The children can read picture books, chapter books, comics or listen to an audio book. There are small special prizes given out every week and special challenges for each club. After July 6, the children can go to the library every week to collect their prize. 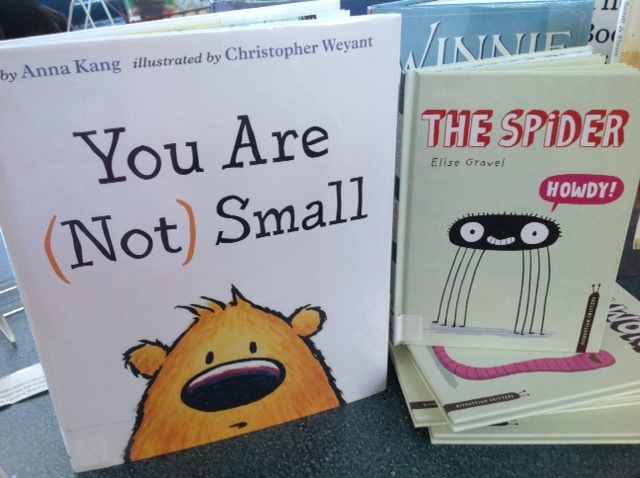 Two books that were shared with us were You are Not Small by Anna Kang and The Spider by Elise Gravel. The children loved the humour of The Spider which is also part of a series so that might be a fun collection of books to start reading. Your children’s librarian is a valuable resource to you to help you find interesting books, at an appropriate independent reading level for your child. You can talk to the librarian and she will help you to join the reading club that best suits your child. The Kindergarten children had an amazing day today at Sports Day. We were so proud of them and their stamina, calm and ability to self-regulate and negotiate a highly energetic day. Congratulations to our little athletes for demonstrating great team work and sportsmanship! Tuesday, June 16: Prince and Princess Day in the Kindergarten. Children may dress up if they wish! Thursday, June 18: Vancouver Aquarium Field Trip for Kindergarten. Please return your permission form by Monday latest. We’ll send home a special notice about this trip next week. Monday, June 22: Kindergarten Beach and Bubbles Party. This will be a fun morning of beach and summer themed activities for our Kindergarten students at school. All Library Books must returned the week of June 15. Next week, June 15-19, is the last week for the Hot Lunch Program. Starting June 22-25, children will need to bring prepared lunches from home. June 15-19 is the last week for the Home Reading Program. Book exchange is on Monday, Wednesday and Friday. All books must be returned by Friday, June 19.